The bridge has got it's funding finally to begin it's repair. The MBTA Board of Directors has approved a $3 million contract as part of a project to repair and rehabilitate the Merrimack River Bridge in Haverhill. Commuter Rail trains on the MBTA’s Haverhill Line travel over the bridge seven days a week. The Merrimack River Bridge is the only bridge in the MBTA system with a similar design as the bridge that collapsed in Minneapolis last summer. 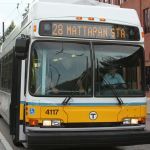 The proposal includes design and construction, and the entire project would be expected to last approximately four years. Thanks for the news Sery I am sick of going over that thing at 5 mph! With stations close to each end what would the maximum allowed speed be? When will the work begin? Having funds approved is one thing, actually starting work is another. And 3 million is NOT going to be enough for that project. Ill bet it will be double that figure or more. 1960s B&M ETTs allowed 35MPH through the Bradford curve and across the bridge. Their invocation of the Minneapolis bridge is pure red herring; Typical deck and through trusses both lack structural redundancy (e.g. there are members that have to remain intact or they'll collapse). 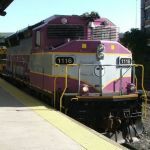 MBTA commuter rail regularly uses at least 3 through trusses dating from the same era and maintained to the same standard (they don't span water, though). The issues here are 1) the masonry bridge piers need re-pointing, at least, 2) they put off replacing the deck timbers, and 3) it hasn't been painted in probably 50 years. IMO $3M should suffice for everything except maybe new paint. jbvb wrote: The issues here are 1) the masonry bridge piers need re-pointing, at least, 2) they put off replacing the deck timbers, and 3) it hasn't been painted in probably 50 years. IMO $3M should suffice for everything except maybe new paint. I heard it needed everything you mentioned a well as some issues with the foundations underwater. I heard there was some trouble with washing out under them. Apparently that was why the restriction is now one train at a time and 5mph. Don't know much more then that. Monday I saw a pile of freshly-adzed bridge ties between Bradford and the bridge; Today I saw a Pettibone with a boom in Haverhill, so I guess the replacement program has resumed. jbvb wrote: Monday I saw a pile of freshly-adzed bridge ties between Bradford and the bridge; Today I saw a Pettibone with a boom in Haverhill, so I guess the replacement program has resumed. The work is due to start any day now. Supposedly will take at least 2 years. Whole new deck and alot of rivet replacement. Paint, and other TLC long overdue. The builder's plate on the through truss span says 1919. The piers look like they were raised when the Haverhill station grade separation was done, but I've never seen serious research of its history. How will they run trains for the next 2 years when the deck is being replaced? I can't imagine removing the whole bridge then rebuilding it from the ground up on a somewhat busy train route over 2 years. Why so long to do it compared to the Amtrak bridge replacement in Conn.? The bridge timber replacement has been done a few at a time since they started last summer; they get a batch of ties ready (adzed to fit over specific support girders, I think) by the junction of the former Georgetown Branch in Bradford, and between the rush hours lug them out onto the bridge with the Pettibone, jack up the rail and fit them in. Apparently they can't get ties the same size as the originals, as the new ones are both shorter and smaller in cross section. So everywhere they've fixed, the running rails are shimmed up about an inch and the outer guard timber is replaced with steel strapping. In some places the inner guard rail is missing, too. Either something else distracted them, or they ran out of bridge ties again; No noticeable work since early last week.